Is good pedagogy a way to make our schools more equitable? Is it the best way? I couldn’t stop thinking about these questions in our Twitter Math Camp morning session on equity and activism: Do we need to use math to explore ideas of inequality in our world, or can we dismantle the inequalities present in our classroom simply by helping elevate the voices of our students who have been marginalized by their previous math experiences? In other words, is good pedagogy a way to make the math world a more just and equitable place? Is it sufficient? Let’s take an example. Let’s say you teach 8th grade math in a racially and economically diverse school just outside Birmingham, Alabama. In your room are a lot of students who have negative identities as math learners: kids who don’t feel like they can do math, or perhaps they can do math, but they hate it. And you notice that those kids are disproportionately girls, students of color, and kids from low-income households. So one thing you could do is tie the math ideas you are teaching to real-world scenarios that inform your students about the inequities of the world around them. You look at the number of female senators in 1977 and 2017 and find out that the number went from 3 to 23, which is a 667% increase. Wow, that’s huge number! So what was the percent decrease in male senators? Well, there used to be 97 male senators, and now there are 77, which is a 21% decrease. Wait, what? How can those percents be so different? After all, we are talking about the same 20 seats that flipped from male to female. So how can a 667% increase also be a 21% decrease? This helps with the important mathematical idea that percent change is dependent on the original amount. Since there were only 3 female senators, any additional female senator is a huge increase, from a percentage perspective. So a shift from 3 to 23 is transformational. From the other perspective, if you are one of 97 male senators, losing 20 senators is noticeable but not world-shaking. It’s a 21% decrease. So there you go. A beautiful demonstration of an important mathematical idea that is also tied to an important moral lesson: When we make a space more equitable, the positive effect on the marginalized group is waaaay bigger than the negative effect on the dominant group. Which I believe morally as well as mathematically. Ok, so that’s one option. But not every mathematical standard can be easily tied to an investigation of this sort. Or maybe they can, but I sure as hell don’t know how to do that. And I have to be honest here: I want all my lessons to be mostly about math. I don’t assign poster projects because I feel like kids spend 15 minutes learning math and 3 hours learning how to make posters. And even though I care deeply about equity, I don’t want my math class to be 20% math and 80% discussion of equity. I feel like I must empower my students, and that means helping them find a positive math identity and a set of mathematical ideas and skills so that they are armed with those tools when they enter high school. So what else could I do? Well, I could just use good pedagogy! I could avoid calling on the kid who raises his hand first (and it usually is his hand). I could give students more spaces to discuss the math informally with each other, so they build confidence with their peers before being asked to share with the whole class or sharpen their explanation with formal terminology. I could ask a shy kid’s permission to share their work so that they feel like their identity as a mathematician is affirmed, even if they choose not to share. I could build a learning community where each kid, especially those who feel marginalized by school, have a voice in my room. In short, I could just be a good teacher. So here's my answer: we do need to use good pedagogy, but our teacher moves need to be informed by our commitment to equity. As Max and Tina said to me, if you go around the room looking for interesting mathematical ideas in student work that you’d like to share, you’re being a good teacher. But if the math is your *only* consideration, then you will probably end up replicating and perpetuating the math identities in your classroom, both positive and negative. The kids who feel mathematical will feel encouraged to explore new ideas, you’ll continue to affirm those ideas and those students, and the kids who feel less comfortable will continue to feel excluded from math. But if you walk around the room noticing the work and noticing the students who are coming up with that work, you might choose a different student's work to highlight. By the way, I do not think you should make this decision-making explicit. I have sometimes said in class “I haven’t heard from any girls yet” which I think was actually counterproductive and perpetuated the problem, for reasons I’ll explain below. But I don’t mean that mathematical identity is the only identity we should consider in class. That sounds too much like “colorblindness,” where we pretend like we don’t notice that everyone we teach is a distinct collection of many, many identities. I think we should try to honor every child’s mathematical identity as well as their cultural identity, but we should decouple those identities. I don’t want my students to think that their cultural identities are tied to their mathematical ability, or vice versa. So when I said “I haven’t heard from any girls yet” in my class, I think I was bringing their identity as female to the foreground and tying it to their mathematical ideas. Which, as Grace said to me, can cause stereotype threat, this phenomenon where women and people of color perform worse on math tasks if they feel that their performance will be a reflection of their gender or race. So I want to hear from more girls in my number talks, but I don’t want them to think that I want to hear from them because they are girls. Because then they’ll start wondering why, and what being a girl has to do with math anyway, and then I’ve tied their gender to their math identity. Or more accurately, those identities have already been tied together by society and I’ve just tugged the knot even tighter. So instead I’m going to start going up to my female students and English language learners and students of color and tell them that I want to hear from them, as individuals, in math class because I think our class would be better with their voice in it. That’s my answer to this question, at least for now. What’s yours? One of my favorite pastimes is talking about math with kids. I love following the Talking Math with Your Kids hashtag on Twitter (#tmwyk) and I love sharing my own snippets whenever my kids and I have an interesting conversation. Recently, my wife and I have been preparing our house and lives so that we can start talking math with our third child (starting on or about February 20th!). As a result, I have basically stopped using Twitter until I make it through the initial maelstrom of parenting a newborn. I still have great chats with my kids, though, so I decided to write them down and collect them into a single post. Here goes! For context, My son J is 5 years old and my daughter H just turned 3. In these talks, I mostly spend my time just asking "why?" over and over, which is the easiest way I've found to learn as much as possible about how my kids are thinking. J: Is Aunt Lil 29? Me: Yeah, she is. Why? J: Because Grandmama told me that when you were 5 Aunt Lil was 2 and there's two years between you and now you're 32 and so she is 29. It's the same thing between you but not the same numbers. J: Daddy, what's the biggest number? J: No, everyone knows 100 and all those are less! J: What's the biggest number that has a name that you know? Me: I think a googol. Me: But you can always make a bigger number by adding 1. So if you take a googol and add one then you have a googol and one, then a googol and two, and so on. J: But how do you know it's a real number? Me: If you add a real number to another real number, the answer is always a real number. So you can always make bigger numbers. Joel: Like five zero five? Me: That would make 505. Here I think Joel and I were not describing the same version of adding. I was describing the mathematical operation, but I think he was talking about saying number words and seeing if they make a real number. Sometimes this works, as in twenty-thousand, and sometimes it doesn't exactly work, as in thirty-four-zero-five-hundred. I am not sure exactly what he meant by five-zero-five, because 505 is only one of the possible options. I hope he asks me about this stuff again! H: 82, 83, 84, 25, 26, 27, 28, 29, 30, 21, 22, 23, two mississippi, five mississippi, Daddy, I'm doing math! J, H, and I spin a fidget spinner and set it on the table. Me: It takes a long time to stop. How long do you think it will take? J: Your height. And now it's right here (points to my chest). J: What has more space inside, a pentagon or an octagon? Me: Well, which has more, a triangle or a square? J: The sides are straight up and not slanted. Me: How about a square or a circle? J: Because it's round? Oh wait, a square! J: Because if you put a circle in a square the corners still have spaces. Me: What if you put a square in a circle? J: The square would shrink. Me: So which would be more? Me: So how do we answer this question, J? I love this question as well, and I hope he comes back to it! I've learned that sometimes it's best to leave my kids a little unsettled, rather than provide a definitive answer. It keeps them chewing on that same idea. There are so many ways to define the parameters of this question, so we'll see where he takes it. Or maybe he won't! That's fine, on to some other idea. I'm Designing the Perfect Math Class. Help Me. My principal has agreed, in theory, for me to teach an elective next year entirely dedicated to exploratory math. I am absolutely thrilled, of course! I am also trying to put together a pitch for the class that will excite the administration and get middle school kids interested in taking the class. For context, this would be either a semester-long or year-long math course for 7th/8th graders in my school. I want the stuff we do to be accessible to kids who aren't traditionally successful in math class, although I am going to assume some familiarity with any concepts up through 6th grade. This section is the broadest, but I consider it a whirlwind tour through all the classic cool math stuff like Fibonacci, Golden Ratio, etc, along with lots of non-routine problems to solve. PLEASE help me with other suggestions! I especially need ideas for the back half of the class. I know there is a ton of stuff out there, so give me everything you love to do on special days in class. Thanks in advance for helping to create the greatest math class of all time (I hope)! A couple of weeks ago, I had a thought: Do all linear functions pass through a point where the x and y coordinates are the same? I had a fun time thinking through that question, so I decided to turn it into a lesson to see what my Algebra 1 students did with it. For context, we had just spent the past week solving systems of equations by graphing and substitution. We had not yet discussed systems with no solution. Mr. Haines was sitting at home, thinking about math as usual, when he came up with a hypothesis: Every linear function passes through a point where the x and y coordinates are the same. Mr. Haines wasn’t sure whether or not this was true. It felt true, but how could he be sure? So he thought of a bunch of examples. For instance, y=1/2x+4 passes through the point (8,8). But he still wasn’t 100% convinced that he was right. I gave my students ten minutes to work on the problem silently. 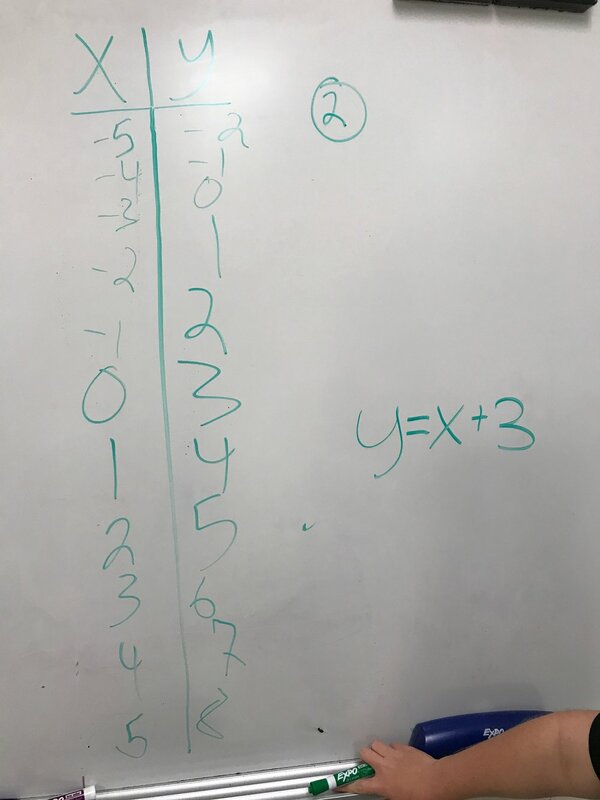 Most students seemed to go about proving that y=1/2x+4 did indeed pass through (8,8) and then moved on to making up other functions and seeing where they had matching coordinates. Interestingly, almost nobody graphed the line y=x. I think that if I had said "My hypothesis is that every line crosses y=x" then students would have very quickly answered my question. By framing the question slightly differently, I got them to think a lot harder. Once the 10 minutes elapsed, I grouped them randomly at my vertical white boards and asked them to work together to prove me right or prove me wrong. Kids had all sorts of approaches. Many groups tried to prove me right by exhaustion, trying function after function and finding the point where x and y matched. Other groups searched for a counter-example and found one. Once everyone had gotten a chance to work and think through the problem, we would gather around one board and listen to that group explain their thought process. I loved this group's work because they were able to prove that x and y could never be equal, since y would always be 3 more than x regardless of the x value you chose. Then I would ask for another example of a line that never has matching coordinates. Kids would say stuff like y=x+1 or y=x-2. One kid said "y=x is the opposite. It like super works for your hypothesis"
At that point, I pulled Desmos up and graphed y=1/2x+4. Then I graphed the point (8,8). I graphed a few more points and their matching points, then hid all the lines on Desmos so that only the points were left. I said "What do you notice?" Right away, kids were shouting that it made a line, and that the line was y=x. So then I asked students to give me equations for lines that disprove my hypothesis. We graphed y=x+3, y=x+1, y=x+1000000 and talked about what they all had in common. As the kids rightly noted, all those lines are parallel. So parallel lines never intersect, so they have no solution in a system of equations. I made a quick analogy: If I give Ashley $100 and give Elaine a nickel, then every day I give them $1 each, when will Elaine have as much money as Ashley? Never, because they have different starting amounts (y-intercepts) and the same rate of change (slope). We ended the lesson with a quick talk about the difficulty of proving vs. disproving a hypothesis. You can't prove a hypothesis like this by trying 10 functions. After all, most functions do cross y=x somewhere, and there are always more functions to try. It's much more effective to try to disprove a hypothesis. Then, if you find a single counter-example, your job is done. And sometimes you learn something about the problem that makes it easier to actually prove the hypothesis. For once, I felt like I was getting my kids to do math in the way that I've always heard about university math (which I never took past multivariable calculus). I think this is the most impactful way I've taught about systems that have no solution. I'll definitely be using this next year, and I really recommend it for other Algebra 1 teachers. But that wasn't my favorite part of the lesson. My favorite part of the lesson was this one kid, T, who came up with a stunning visual proof of the problem. When he first explained it to me, I honestly did not understand what he meant, but I could tell there was something interesting going on, so I switched on my camera. I did a bad teacher move at the end, where I explained his proof to him rather than letting him explain it, but honestly I was so excited by his idea that my gleeful math brain took over. I love this moment of class so much because T is seeing the problem in a way that I never would have come up with if I had spent a year thinking about this problem. And by the way, he's (almost) right! Every linear function would eventually make a square, if you include squares with an area of 0 that occur right at the origin. The only problem is, his amazing insight doesn't prove the thing that T thinks it does. Every linear function forms a square in the way he describes, but some of those squares occur when the coordinates are opposites, such as the point (-3, 3) which would be on the line y=x+6. But I was so excited by T's idea that I ran to my desk and made a quick Desmos graph to show the class how his theory worked. If you pay careful attention, you'll notice that this function, y=1/2x+4, actually makes two squares at different points, (8,8) and (-2,2). The lines like y=x+3 that disprove my hypothesis only make squares once, where the coordinates are opposites. By the way, you can play around with my Desmos graph here. Anyway, after class T came up to me and said "Why did you film me if I was wrong?" I said "Because you had an amazing idea!" T said "Yeah but it was wrong so it wasn't useful." The reason I filmed that moment is because T's idea broadened my conception of the problem. It made me see a visual structure to linear functions that I had never seen before, and it made me wonder what other ideas I could prove or disprove with this theory. It made me wonder what types of rectangles you'd get from visualizing quadratic functions, exponential functions, logarithmic functions this way. It made me realize that if you graph all the rectangles that are made by y=20/x, you get an infinite amount of rectangles that all have an area of 20. And it made me want to share his video with as many other math teachers as possible so I can hear what they wonder. In other words, T's idea made me feel like a mathematician, and I hope it made him feel the same way too. He wasn't immediately right, but neither was Andrew Wiles when he proved Fermat's Last Theorem. And his idea opened up a whole world of other opportunities for insight that I've barely been able to think about yet. So T, if you're reading this (and you better be since I am emailing it to you as soon as I'm done writing), I hope you take this moment as a victory. You invented a new math idea, which most kids very rarely get the chance to do in math class. You should be proud of yourself. I'm sure proud of you. My first year of teaching, I was the entirety of the middle school math department. I was the only person in the building who knew very much or cared very much about middle school math. That situation led me to find my online community of math teachers, but it was very lonely on a personal level. Then, the school hired Dennis Gallagher to teach a couple of courses for our school's most mathematically inclined students. For the first time, I had a colleague and a mentor. Dennis passed away yesterday. I want to tell you more about him. Dennis had the best introduction to Algebra 1 that I've seen. He started the first day with the handshake problem. Students had to determine the total amount of handshakes that occur if everyone shakes everyone else's hand in the room, and then write a formula for a room of n people. At the end of that day, he would say "What you just did is notice a pattern, extend it to a larger number, and then generalize it into an algebraic expression. You just did algebra." The next day, the students find the amount of diagonals in a polygon. Again, they'd find the amount for a rectangle, pentagon, hexagon, and finally a polygon with n sides. The formula, which is a variation on the formula from the previous day, helps make the connection clear: If you arrange a room of people in a circle, every handshake can be drawn as a line segment connecting two people around that circle. So again he would end class by pointing out that these two totally different problems were actually closely related from a mathematical perspective. "You took ideas and skills from yesterday and applied them in a new and surprising situation. Now you're really doing Algebra. And that's what we'll be doing in this class, over and over again." I remember stepping back from the table as he explained this sequence of lessons to me, both of us almost giddy with excitement. Yep, that's how you start a math class. I loved Dennis as a teacher and colleague, but more than that, I loved him as a partner in doing math. He taught a geometry class, which he knew was my favorite. Occasionally he would pop into my room holding a sheet of paper: "Ben and Louisa and I have been working on this problem for 20 minutes and we can't figure it out. Want to give it a crack?" I'd work on it all during my lunch break and at home, ignoring emails and piles of ungraded paper all the while. Then I'd come in the next morning to show them what I'd got: "I still don't know how to solve it, but I did figure out that these two triangles are similar..." and they'd be off to the races. The book Dennis gave me when I moved back to Alabama. In those moments I didn't feel like a teacher. I felt like a member of a team, working alongside other people to figure out this tough problem. It didn't matter that one of those team members was around 60 years old and the others were 13 or 14 (or, in one remarkable instance, 8). We were all trying to crack the same problem. That radical parity felt natural to Dennis, and over time it began to feel natural to me. Dennis was never an answer key kind of guy. He would rather experience the math right alongside our students, because in the end the thing that brought him the most joy as a teacher was simply doing math. And he was the first teacher I ever saw who filled a room with his enthusiasm for the subject. Six years later, I am still trying to show my own students a fraction of the love of math that Dennis simply exuded. Dennis had a long and fascinating life that I know the tiniest portion about. But I will forever remember the part of it that he shared with me. Find What You Love. Do More of That. Over the past month, I have been playing lots of mathy games for an upcoming project. My favorite of those games is Blokus. Essentially, Blokus is a game where you compete for space. Each player places these Tetris-looking pieces on the board, touching only at the corners, until everyone runs out of room and counts up the pieces they have left. It's a little more complicated than that, but not much. That's part of why I love the game. Blokus is simple to understand, fun to play with kids and adults of all ages, and strategically complicated enough to keep me engaged over and over. Most importantly, the pieces are really fun to play with. While you wait for your turn, you play around with the pieces, forming squares, rectangles, and all sorts of other creative shapes. Even if there were no game element, I'd still be in love with the Blokus pieces as a tool for mathematical exploration. As I played with the game, I realized that the pieces were all the configurations that can be made from 1, 2, 3, 4, and 5 squares. I looked it up and yep, there's a whole branch of math about these shapes (which are known as polyominoes). I was at Twitter Math Camp in Atlanta this summer, soaking in all the math and conversations I could after five years of pressing my face against the window of Twitter. My favorite part of TMC was definitely building mathematical objects. I played with Christopher Danielson's Versatiles during his session on Math on a Stick. I made patterns from double Truchet tiles that Andrew Browning-Couch made. I played with Justin Aion's hexagons, both homemade and raided from a dozen local Targets. I made a box with the #origamipals. I helped a huge group of teachers take over the hotel lobby and make a Sierpinski gasket with Malke Rosenfeld. I helped assemble some shape I can't even pronounce or understand with Annie Perkins, Edmund Harriss, and a ton of other folks. Below, you can browse through some things built by myself and others over the course of the weekend. I had a lot of fun building things. And while I was building things, I started thinking back to Blokus. I wondered: What if instead of using squares, you built all the possible configurations of 1, 2, 3, 4 or 5 hexagons? I started sketching in the middle of another presentation and pretty soon had found all 28 configurations. Success! Then I went searching around the internet and discovered that there are actually 34 possible configurations. Also, once again there is an existing set of mathematical discoveries about these shapes, known as polyhexes. So I am sketching these shapes at TMC and just itching to get my hands on them. I was complaining about this to Megan Schmidt, when she suggested that I use hexagonal mosaic tiles that people often use in their bathrooms to build the shapes. As soon as I got home from TMC, I went straight to Lowe's. First, I just cut the pieces out of the mesh, just to get a sense of what they all looked like. This wasn't a great set of toys because the mesh gaps, while useful for catching grout, don't make for clean lines and tight fits. Also, the pieces weren't reversible, which was problematic. Eventually I settled on an approach to building them. First I glued two tiles back to back so that the tiles would be reversible. Then I started gluing pairs of tiles together, letting them dry, and slowly building my polyhexes. Finally, this morning I was done! I pulled them out with my kids, age 4.9 and 2.5, and let them go to town. First, the bad news. The adhesive is pretty good, but not good enough to withstand a toddler. I think when I build my next set (and you know I am already jonesing for another set) I will use the mesh from the mosaic tiles as a way to help the pieces keep their structure. I might glue one layer together, glue the mesh on top, and then place the second layer over the mesh. Hopefully that will give the pieces a bit more endurance. But the good news is that THESE ARE AWESOME. Just like the Blokus pieces, they simply call out to be combined. The pieces slide together in such a pleasing way, at least when I glued them accurately, and they're easy enough for my son and daughter to construct huge shapes with. They're a little uneven in places and have glue stains on them and are already falling apart a bit, but I love them. They are my babies. I have an inkling of a game mechanic that might make these pieces into a fun game. But even if I don't find a way to gamify my polyhexes, I will still be so happy to have these pieces to play with and learn from. So thank you, Christopher Danielson, Megan Schmidt, Annie Perkins, Malke Rosenfeld, and anyone else who shares their trials and errors in making mathematical objects and mathematical art. You guys gave me the courage to turn this idea into a real thing. You helped me find what I love and do more of that. Tiny Polka Dot is a game developed by Dan Finkel and the crew at Math for Love. It is essentially a set of nice, pleasing cards with dots on them, spanning from 0 to 10. Some of the dots are ordered, while others are intentionally disorganized. The deck comes with a set of cards that give the rules for simple games that kids can play. Most of the games are perfect for kids between the ages of 3 and 7, although there are some activities that were fun and challenging for me! This morning, my son and I decided to play a game. I got all the cards with numbers from 1to 6 and placed them face-down in rows. Our goal was to pick two cards. If the cards add to 7, you keep the pair and pick again. J has been playing all sorts of matching games at school recently, so this felt like a mathy spin on his current favorite game. During the game, I noticed that J had some of the pairs memorized. When he flipped over a 6, he would say "Now I just need a 1." When he flipped over a 5, he knew he needed a 2. At first, this seems like a redundant question. After all, J knows that five and two make seven, right? But that's not actually what J knows. He knows that if he already has five, he needs two more to make seven. I'm asking him a different question. I'm saying "If you already have two, how many do you need to make seven?" This feels like the same thing to a parent, but to a young kid it's a very different question. He doesn't yet know that 5 + 2 = 2 + 5. He hasn't internalized the commutative property. So he is starting this question from the beginning. Anyway, J is pondering over these two cards, and he decides to count them again. He counts to eight, then pauses before saying "Seven" I ask him "Two and seven make seven?" and he scrunches his nose to indicate that yeah, that doesn't sound exactly right. So he counts again, gets to eight, and this time says "One." Again, I prompt: "Two and one make seven?" And he says "no, they make three." I think that in each case, J is noticing that his total of eight dots is one too many, but he doesn't know how that affects the answer to my question. First he compensates in the wrong direction, then he answers "one" because he is thinking about the one extra dot. So he counts again, gets to eight, pauses and then says "4?" I can tell he's starting to lose track of the problem, so I cover up two dots with my thumb and say "Ok, let's check. Does two and four make seven dots?" He counts and quickly says "No, five!" So I cover up a single dot and he counts to confirm. Success! Two and five make seven! Later on, we finish the game and are comparing how many matches we each made. I've already counted my eight matches, but J mixed all his cards together, so he can't easily count them. He starts matching each pair again, painstakingly counting dots as he assembles his line Again, from my perspective he could just match the cards up randomly and then count the pairs, but J is still working on how addition works. So he's going to match them all up first and then count. I love a lot of little things in this video: the way you can tell when he is confident in his matches and the moments when he has to count to confirm. The way he counts the first row of his cards, then swipes his hand and says "Twenty!" The way he guesses that I have 18 cards. After all, he had ten pairs and twenty cards, which is just ten more. I have eight pairs so I must have eighteen cards. It's a fantastic hypothesis, and it reminds me that kids have ideas about math. Those ideas make sense, even if they are wrong. Joel used a shortcut that worked, but then applied it in a different scenario where it no longer worked. And he'll keep doing that over and over for the rest of his mathematical life. Oh yeah, my review. Tiny Polka Dot is absolutely fantastic. It gives J a structure that he enjoys exploring, and when he tires of the Match 7 game, we will move on to Match 8, Match 9, or any of the dozens of games and iterations we can create from these cards. These cards are going to be part of our playtime for years to come. Below is the follow-up email I sent to parents after my Math Explorations event at the library. Thank you so much for attending Math Explorations yesterday! I had a blast working with and learning from your kids, and I hope they enjoyed themselves as well. If you were wondering how yesterday's activities connect to school math, or if you want to know how to continue the fun at home, I have some ideas below. How do mirrors and markers relate to learning math? Most kids, and most adults, think that math is all about numbers and operations. While numbers and operations are important to math, they are only one piece of the overall puzzle. In fact, math is about exploring the structures of the world, whether those structures are shapes, numbers, or patterns. My goal for this workshop, and for all future workshops, is to give kids a chance to play with objects whose structure sparks their curiosity. Everything your child did yesterday, from cutting folded paper, to mirror drawing, to playing with the hinged mirrors, contains some inherent symmetry that is worth exploring over time. Just within an hour, the amount of creative and surprising ideas I saw from kids was remarkable. When kids play with mathematically rich objects, their ideas inevitably get more complex and more creative. Kids work towards a goal, noticing patterns along the way that help them reach their goal, which in turn leads to newer, more challenging ideas. At first, your child might draw random shapes with mirror drawing, just to see what they look like. But after a bit, she may get an idea. How can she draw a heart? Now she is visualizing the end result and working backwards, improving her spatial reasoning. Or maybe she decides to draw a house, and she starts counting the little grid lines on the paper to make sure both sides of the house are the same length. She might not have noticed the grid lines at first, but after exploring for a few minutes, she is using the structure of the paper to refine her ideas and improve her work. How can I help my kids explore symmetry at home? The best thing you can do for your kids is to get out some paper, some scissors, some markers, and a mirror or two and just let them play. If you want a hinged mirror, here is where I ordered mine for $3 apiece. While your child is playing, you can offer a suggestion or two, but don't feel that you need to guide them to a specific goal. They will be far more interested in persevering if they are trying to accomplish a goal that they came up with themselves. The best way I've found to inspire my kids to explore an idea is to ask a question. Instead of saying "look what happens when you cut out a triangle from this paper," you can ask "What happens when you cut out a triangle?" Sometimes they'll take the bait. Sometimes they'll ignore you. That's fine; it just means they are working on a different, more interesting idea. Okay, this email has gone on far too long. As you can tell, I am really passionate about math! If you have any questions, ideas, or ways to improve the session, please send me an email. I would love to hear your thoughts. Also, if you know of anywhere else that might be interested in this math programming, let me know! I'm hoping to start a monthly series of these events at Homewood Library in the fall. I'll be sure to email you again when I have a firm date. An hour ago as I type, I wrapped up my first math event. About 20 kids showed up, which was equally invigorating and terrifying. In the end, it was everything I had hoped it would be. I can't wait to do it again. I mean, just look at what the kids did today! Mirror Drawing - A month or so ago, my son grabbed two pieces of chalk and started moving his hands symmetrically, making designs on the driveway. Here's a video of me filming his invention while pretending to check something on my phone (he's shy). This moment was the inspiration for the entire event today. And these kids took the idea and ran with it! Check out Allie, who wrote her name backwards and forwards, as well as the two kids with very different interpretations of my suggestion to "draw a person." Hinged Mirrors - I gave kids some hinged mirrors and a white sheet of paper with a black line on it. Kids started just playing with that, but it wasn't long before their own markers got into the game. And when I brought out the jelly beans, kids made some mixed media masterpieces! Check out the two girls who drew a symmetrical person on the line of symmetry and then added the hinged mirrors. Also, look at that last circle of jelly beans. There are only two actual jelly beans in that picture, believe it or not. This was the best part of my year. Tomorrow, I'll share the email I'm writing to all the parents who attended today's event. Tomorrow afternoon at my local library I am running an hourlong math exploration for kids age 4-7. I've decided to focus the event around the idea of symmetry. This is what I'm planning to do. First, I am going to start the session with a book or two. Laura, the librarian who has been helping me, has pulled a few books about symmetry, mirrors, and other things. I haven't chosen the books yet, mostly because I haven't been able to make it to the library yet. I hope to get there tomorrow morning so I can read through them all and choose a couple to use. In any case, after this we will move to some folding and cutting. I have lots of construction paper and scissors, and at first I am going to get kids to fold their papers and cut them along the folded side in any way that they want. I just want to see what kids can come up with when they get a chance to fold and cut paper. But because I am a bit nervous about my mixed-age environment, I've come up with some challenges that the older kids can try if they'd like. My favorite part about these challenges is that they are equally fun for adults to try to do. I recommend you try some on your own. Cutting out a triangle from a folded piece of paper is harder than you think! Once we've sat for story time and cutting and folding, it's time to move some more! I'm going to have kids run around the room and then stop and find a partner. They will act as mirrors for each other. I played this game in play practice in high school, but I think younger kids will enjoy it even more. It's fun to be the lead, and it's even more fun to be the mirror. After they've done that, I'm going to lead kids in some mirror drawing. This is an activity inspired by my son, who spent some time at a birthday party drawing symmetrical designs by grabbing two pieces of chalk and moving his hands inward and outward in symmetrical patterns with each other. The idea is to try to imagine a line of symmetry running down the middle of the page. Each hand mirrors the other. I have no idea how this will go, but I'm excited to see! I imagine a lot of frantic waving of markers, but I am really curious what kids do when they actually try to draw an image. To that end, I made up some challenges for this activity as well. As with the last challenges, they are equally fun for adults and kids. Seriously, try to write your name with your bad hand and then mirror it with your good hand. It's great. Once we finish this section, we are on to the best part: free play! During this time I will have a bunch of stations, all inspired by Christopher Danielson and Math on a Stick. We'll have eggs and cartons, a pattern machine, 21st Century Pattern Blocks, tiling turtles and tiling pentagons. During this section, the only recommendation I have to kids is "If you want, make something symmetrical and show me." To add to the fun, I have a bunch of hinged mirrors that I will give to each station. I have become somewhat obsessed with mirrors in the past year, and I love seeing all the fun things that people can come up with when given a reflective surface. After free play, we are done! Something I made with pattern blocks and mirrors. Honestly, almost everything! I have never facilitated a group of kids this age before. I don't have the basic management skills that a 1st grade teacher has, and I don't know how to thread the needle between allowing creative play and providing structure for kids to thrive within. I really hope that the kids that come can meaningfully interact with all these different activities, that I haven't chosen tasks that require fine motor skills that young kids don't have. I am happy to have my backup plan of Danielson-approved free time in case my planned stuff crashes and burns in 20 minutes. Also, I feel like I am going to be trying to have two conversations at once. The main conversation will be with the kids, interacting with their math ideas, but I will also want to talk to the parents about how to interact with their kids while they are playing with math. I have a cheeky list of rules I came up with, but I am torn as to whether to post them. Are they lighthearted or obnoxious? Or both? I don't know. To mitigate this tension, I am going to collect parent emails and send out a follow-up email, where I give parents tips on extending each of these activities and also direct their attention to some good ideas for talking math with their kids. I'll post again soon with a debrief of this event, as well as the text of my email to parents. I realized recently that I have three stories that I tell my students about operations, but I've never shared these stories broadly. None of these stories are true in a strict sense, but I think they help to convey important mathematical ideas. This is the first story. Math seems like a set of ideas bestowed upon us from Mount Euclid, but in fact it has been slowly developed over many hundreds of years by people. At first, people invented math systems so they could count sheep, loaves of bread, and other tradable goods. Babylonians used a system based on 60, but most societies eventually settled on a system based on 10. But as people counted and counted and counted, they realized they could make a shortcut. Instead of counting one group of sheep and then another group, why not just add the two groups together? And so addition was born. Of course, shortly thereafter people realized they needed an operation that undid addition, and so subtraction was developed as a related operation. These two operations are known as inverses, which means they have opposite effects. For a long time, addition and subtraction were the only operations. So ancient mathematicians invented a beautiful shortcut for adding the same number repeatedly. They called it multiplication. And to undo multiplication, people invented division. Two more inverse operations. Whenever people had a big long math problem, they would multiply and divide anywhere they could before moving to addition and subtraction. Multiplication and division were shortcuts, of course, so it made perfect sense to do them first. And that's how it was for hundreds of years. People would multiply and divide, and then add and subtract. But over time, people got sick of repeatedly multiplying the same number over and over again. So they invented yet another shortcut, known as the exponent. It's a quicker way of doing repeated multiplication, which made things much faster. And at the same time, people came up with its inverse, which is finding the root of a number. At this point, people felt pretty good with their operations. You do exponents and roots first, then multiply and divide, and then add and subtract. First the shortest shortcut, then the next one, and finish up with old-fashioned adding and subtracting. But what if you want to add first? How do you communicate that to other people? You need some sort of symbol that indicates a smaller, special group of numbers and operations. So people invented parentheses, brackets, fraction bars, and all sorts of other grouping symbols. So you do the math inside grouping symbols first, then do exponents and roots, then multiply and divide, and finally add and subtract. And that's how the order of operations was invented. Out of order. I finally got a pattern machine in front of my four-year-old son J, and it has been love at first sight. He loves the bright colors, the satisfying cli-click that each button makes, and the endless possibilities for designs and patterns. So far he has made a tree with a sun and a moon, a row of blaster guns, and a house. On Saturday, J made this shape. "Look Daddy, a square!" I saw an opportunity to firm up his definition of a square. "Count the sides." J counted the bottom side and got five, but then had trouble deciding where to start counting along the right side. After all, he had already counted the bottom right square as part of the bottom. Was it part of the side as well? This concept of when and how to count, like the concept of halfway, is something I have seen as often in my middle school class as I've seen from my son and his friends. Typically my middle schoolers struggle to count grid lines to find slope or translate a triangle four spaces to the right. Should the count boxes, or the edges of the boxes? How do you use discrete objects to measure continuous distances? These measurement ideas are certainly something I want to read more about, but I'll have to save that for later. What I did instead was tell J to start counting at the corner. He did so and got a length of four. I told him "Squares have four sides that are all the same. So this rectangle is not a square. Can you make a square?" This was his second draft. Again, I said "Count the sides" and noticed that he still hesitated before double-counting the corner square. He got sides of six and four. I said "Still not a square." Then he made the one below. He sat back triumphantly and said "This one is definitely a rectangle." Once again I asked "Can you make a square?" He pushed all the buttons down, then made a C shape that was four blocks high and three blocks wide, and finally popped up the four boxes on the right to make a square! I didn't want to give away the answer, so just like all the other times I said "Count the sides." By this point, J felt comfortable counting his sides, so he counted four along the bottom and four along the right side. I almost said "Congrats!" But then realized that he wasn't done. He continued counting along the top and left sides, confirming that each side did indeed have a length of four. Of course! It felt so obvious to me that counting the base and height was sufficient to prove the shape's squareness, but why would J know that? He needed this moment after he constructed the shape to confirm its attributes. Over time, he may notice that the bottom and top sides always have the same measure, but for now he needs to play with these shapes more and discover these properties on his own. So thank goodness for the pattern machine, which gives J a developmentally appropriate way to construct and examine these shapes! J still has trouble drawing straight lines and connecting endpoints, so of course he's limited in the shapes he can make by hand. He benefits greatly from the discrete structure of the pattern machine, which ensures straight lines and right angles. I also realized that he and his classmates had been exploring other shapes at pre-school, using pretzels to form triangles and other shapes. Check out these pictures from the album that my son's awesome preschool (Yay Chai Tots!) sends out every week. Once again, J and his classmates are using tools appropriate to their age to build and analyze shapes, instead of simply looking at them on a page. I mention all this because my 8th grade students struggle with geometric concepts more than any other topic in math. When teaching square roots, I like to start by finding the area of squares, which is definitely not an 8th grade topic. Yet I still have to provide enormous scaffolds to ensure that my students know what area is and how to find the area of squares and rectangles. I don't know why my students struggle so much with this topic, but I have a theory. I don't think they've spent enough time constructing and analyzing shapes of their own design. Think about it: if you've never used a compass to draw a circle, why would you care about its radius? We don't care about the "radius" of a triangle or a rectangle or any other shape (at least, not in middle school). But if you actually try to draw a circle, the benefit of the radius becomes immediately clear. I know that I looked at circles for years and years without ever considering that they were the set of all points equidistant from some center. Then one day in 7th grade I used a compass and the lights came on. The same tendency is true of the triangle inequality theorem. This theorem, if not experienced directly, seems bizarre to students. The sum of any two sides of a triangle must be greater than the third side? Ok, sure, Mr. Haines. But if you give kids rulers and ask them to draw a triangle with sides of 3, 4, and 17 centimeters, they will quickly realize that the task is impossible. And then you can begin a conversation about which triangles are and are not possible. What if the longest side were 10? 8? Exactly 7 centimeters? Mostly, I don't think students spend enough time actually constructing and analyzing shapes directly. Heck, most students rarely find the actual area and perimeter of shapes. Instead, they are given shapes with pre-labeled sides that might not even be accurately scaled! Look at this rectangle, which was the third Google Image result for the phrase "area of a rectangle." Does the base really look like it's almost three times as long as the height? You might think that these questions are harmless, that they are a good way for students to practice finding area and perimeter. But I disagree. I think that these questions actively undermine our students' visual intuition. I think that as students solve problem after problem of impossibly-labeled shapes, they learn to ignore that spidey sense in the back of their minds that says that these numbers can't possibly be right. I think these problems make our students less capable of solving geometry problems, not more. This blog really took a turn! I am wondering so many things right now. I wonder what percentage of geometric figures in major textbooks are labeled accurately. I wonder whether the rectangle above is the sort of error that a 3rd grader is more likely to notice than an 8th grader. I wonder how many students who could find the area of that 3x8 rectangle could find its actual area if I printed it out, whited out the "measurements," and handed them a ruler. Most of all, I wonder who else has been thinking about this stuff. Let me know in the comments whom I should be reading. We are about to begin working on the symmetry of parabolas and finding the vertex if we know the x-intercepts. In order to find the axis of symmetry, students must find the x coordinate that is halfway between two other coordinates. To prepare for this, I start class with the Number Talk "What number is halfway between 44 and -7?" My students were split between 18.5 (the correct answer) and 25.5 (the distance from -7 to 18.5, and from 18.5 to 44). After several students share their strategies, most are convinced that 18.5 is the answer. But two students, who are among my strongest Number Talks participants, remain unconvinced. One of them, MC, speaks up: "Mr. Haines, I know my answer is wrong but I still can't see why." We are checking homework and students are debating the problem below. To prompt discussion, I ask one table "How tall was Ilana at age 3?" "And how tall was she at age 5?" I am discussing rounding with Joe Schwartz. To me, this seems like such an intuitive idea. Is 81,866 closer to 81,000 or 82,000? Joe, who actually teaches this stuff, is kindly informing me that rounding can be far from intuitive. I ask him what the hardest part is - knowing the correct place value? Finding the upper and lower bounds of 82,000 and 81,000? Joe says "Finding the middle." For his students, the hardest part of rounding is figuring out what number is halfway between 81,000 and 82,000. J picked his number book for bedtime, so I decided to see what his thoughts were on finding the middle. You know when you buy a new car and suddenly you see silver Camrys everywhere? I am having the exact same experience with the skill of finding the midpoint between two numbers. I want to be clear: I'm not talking about finding half of a number. I'm talking about finding the midpoint between two numbers, neither of which is 0. And as it turns out, this skill appears everywhere, at all grade levels. In stats, you might need to find the median of a data set with an even amount of data points. In algebra or geometry, you might need to find the midpoint of a line segment. In 4th grade, you might need to model a problem on a number line that doesn't begin at 0. What should be in the middle of your line? I love this type of question because there are two distinct strategies that you can use to find it, and both strategies can be useful. If I am finding the number halfway between 234 and 452, I can add the two numbers to get 686 and divide by two to find the mean, which is 343. But if I want to know the midpoint of 68 and 88, I don't add them and divide. Instead, I find their difference (20) and add half of it to 68 to get 78. Two totally different strategies, each equally valid and useful depending on the problem. The other reason I'm intrigued by this problem is, I don't know when and where it is taught explicitly. To me, it feels like one of those skills that we assume kids will develop over time, but we never spend a day talking explicitly about these strategies. I was never really happy with the way I taught the concept of functions. My kids could identify functions and use the vertical line test, but I felt like they were missing the big picture about each input having a single output. If I had asked my students why we use a vertical line, rather than a horizontal line, to determine whether a graph is a function, I doubt many of them could have answered. So I decided to restructure the way I teach functions. Last year, I did a big unit on linear functions and then went to functions more generally. This year I switched those topics. I started with looking at functions in all sorts of different ways and then moved into linear functions. So far, this switch has been seriously paying off. My students have a better understanding of the meaning of a function, and I have laid the groundwork for some great upcoming work with slope and linear functions. Below is an outline of what I did over the past couple of weeks, along with notes on what I'd change next time. Warning: This is not a blog post about a finished product with crisp, clean packaging. I threw together this sequence of lessons haphazardly and will change it a great deal next year. But I think the bones of this sequence are beneficial and worth sharing. About a week before my functions unit was set to start, I started doing "Guess My Rule" warm-ups. First I drew the following picture on the board. I told my students "I am thinking of a mathematical rule. I will ask a random student for a number, which I will drop in this machine. I will do some mental math and tell you the output of the machine. After I do this three times, I want you to guess my rule." My first rule, "add 6" was pretty easy, but my second rule, "double and add 4" was hard for students to follow, so they asked me to write the answers on the board. This generated a need for a table of values, which I was happy to provide. Whenever possible, I ask students to describe the rule in words and as an expression, so they are used to writing expressions for functions. But I still haven't used the word "function." For now, I just call it a mathematical rule. On the first day of the unit, I used Function Carnival from Desmos. I love this activity because it is so responsive to kids' exploratory inputs. Also, kids really want to get that "Really Precise" designation, so they learn how to pause the time and find the exact height of Cannon Man at every point! As with all Desmos activities, I find that the best setup is to pair students up with a single computer and only let one person touch the computer at a time. I have the kids switch every few minutes, and that way they are communicating a lot with their partner about how to improve their graphs. By the end of class, I am sure to find a student who has scribbled all over their graph and play that animation for the whole class. I want students to notice how many cannon men there are at one time! This will pay off in future lessons. On Day 2 I use my absolute favorite activity of the whole year: Interpreting Distance-Time Graphs by the Shell Centre. In this activity, students are supposed to match ten stories with distance-time graphs. I give each pair of students an envelope with the ten graphs and ten stories and ask them to get started matching! Meanwhile, I circulate and see if I need to speak with any students who are particularly struggling. When a pair of students has matched all ten of their stories and graphs, I come by to check. I only tell them how many are matched correctly; I don't tell them which ones are correct. I almost never have students who get all ten matches correct on their first try. Most students need two or three drafts to get the answers all correct. After all, there are some tough problems! Which graph shows Tom's distance from home? Which graph do most students choose at first? After every group of students has done at least one draft of their answers, I call on students to match and justify one story and graph. I have big magnetized versions of each story and graph, so kids just go up to the board and shift the magnets around on the white board. I like this portion of the lesson because kids have some agency over which story to match, but everyone knows they could be called on to explain their choices. As kids were discussing their justifications, I noticed that a lot of kids had intuitive thoughts about the way that slope represented speed in the stories. Kids would say things like "It's going up fast here so he is running" or "He's not moving because it's flat here." As we discussed, I realized that I could tap into these intuitions when we finally start to formalize slope. For now, we use lots of terms to describe this aspect of the graphs. Slope, steepness, closer to vertical. Right now I'm just focused on getting kids to read the graphs from left to right and notice how the output changes. We spent a lot of time discussing the graph/story pair at left. I really wanted to hammer home the idea that this graph somehow broke a rule that every other graph was following. I didn't use the phrases "function" or "vertical line test," but I did get students to explain to each other and to me why this graph was just plain wrong. We even talked about what it would've looked like as a Cannon Man animation! Just like on day 1, I was planting the seeds of functions/non-functions and waiting for them to blossom. In the future I'd like to give an exit slip where I get every student to write down their explanation for a specific story/graph combination. This year I ran out of time. On Day 3, we finished the Shell Centre activity. I had never done this part of the activity before, and I was amazed at the connections my students were making. As a warm-up, I asked the students to match all the stories and graphs once more. Then I came around with a set of nine tables of values and asked students to match each table of values to a graph. Once again, I circulated and told students how many they had gotten correct (but not which ones!). As I circulated, I began to notice that students were using slope-related ideas to match the tables and graphs! Listening to kids debate the tables and graph below, I heard kids saying things like "the line is steep so that means he is moving fast, but the numbers in the table aren't moving as fast." It made me very excited to get into slope in the future. How would you decide which table belongs with Graph E? Just like Day 2, I then called on random students and asked them to justify a matched pair of table and graph. Once again, we talked about this impossible graph and how the table matched it. Once again, laying groundwork for a future discussion of functions. Why does Table R match with Graph H? Day 4 I did an activity I created that went poorly, so I'd change this next year. Perhaps I'd have students do the brand new Desmos Graphing Stories activity. The reason this is a good option is that we've spent two days looking at distance-time graphs, and I don't want kids to believe that distance and time are the only variables we can graph on a coordinate plane! The Graphing Stories activity has height, number of eggs in carton (which makes a nice step function), distance from camera, and so on. I can't wait to try it with my students next year. As an extension of the Graphing Stories activity, we could brainstorm some other ideas for x and y axes, then have students graph their own! This might be a way to get kids thinking more about independent and dependent variables. My students often struggle to think of variables as quantities, so perhaps by embedding them in graphs first we can think about how variables must be quantified. I'm still puzzling over what exactly to do here. Maybe I need another day here to explicitly introduce independent and dependent variables. But that's not what I did this year. I just moved blithely along! At least there's always next year. On this day, I make a hard shift from graphs and go back to my function machines. We play three more rounds of "Guess my Rule" as a warm-up, and then I define what is a function. Importantly, I mention over and over that a function is a relation where every input has exactly one output. Then the first dozen or so examples we talk about in class are qualitative, not mathematical. I find that kids understand the distinction better when we start outside of "math world" for a while. I try to emphasize that both examples are rules. They both pair inputs with outputs. The difference is that the second rule could have many different outputs for a single birthday, whereas the first example should pull up the same person every single time you put in a SSN. I then have kids come up with their own examples: three functions and three non-functions. Then they share with their tablemates. I circulate and pick out several interesting examples, and I call on kids to share and justify their answers. This is the day when it all came together for my students. We start the day playing "Guess my Rule" again. The first two rules, x^2 + 1 and "round to the nearest 10," were greatest hits from the previous week, so kids got them quickly. A kid says "13" and I say "11"
Another kid says "7 and I say "5"
A third kid says "10" and I say "2"
Now they are really confused. I ask if they want a fourth number. They do. Another kid guesses "5" and I say " -437"
WHAT??? What is going on? There is bedlam in the classroom. A kid says "There's no rule!" and I say "There is a rule. I am doing mental math." We do another couple of numbers. A kids says "14" and I say "10". Another kid says "6" and I say " -7654"
They INSIST that there is no rule, and I INSIST that there is. Then some kid says it. "It's not a function." Bingo. Say that again for everyone. How can you check to make sure? "Put in the same input and see if we get a different output"
So whatever number was last asked, the students ask again. They say "6" and I say "5." Then they say "6" and I say "-31." Then they say "6" and I say "0." We've figured it out. It's not a function. But we still don't know the rule. Either by prodding or hinting, I get them to realize that all the outputs are less than the inputs. That's the rule. y < x. So now, just in the warm-up, we have had a visceral experience of what it feels like when the same input gives you different outputs. We know that's not a function, and we know why. Once we finished the warm-up (which was really a full lesson in disguise) we started looking at other ways that functions present themselves. First, we looked at some familiar graphs. My students were able to describe why the second graph was not a function. I even had kids say things like "If you draw a line straight up the middle, it goes through the graph two times." I made sure to ask them why the horizontal line was acceptable, but the vertical line wasn't. Then we looked at a pair of familiar tables. Again, I made sure to ask students why a repeated output was acceptable but a repeated input was problematic. We even tied this back to the warm-up rule about rounding to 10. There are lots of numbers that round to 20, but they always round to 20. The rest of the unit, I used the same stuff I've done in the past. We worked on a functions card sort and an independent/dependent variable card sort, both of which I adapted from Sarah at Math Equals Love. We drew graphs to match stories and wrote stories to match graphs. We took a quiz that went well! I was pretty pleased with how it all turned out. Mostly, I loved the feeling of coherence that I got in my first six days of the unit. To the students, it probably felt like a wide variety of different activities, but they were all devoted to getting kids to read and interpret functions in a variety of different contexts and representations. It was the type of lesson planning that I've been aspiring to for the past seven years, and this felt like one of my most successful lesson sequences of my career. While you wait, help me brainstorm! What should I do for Day 4 next year? What important topics am I missing, or feel undercooked in this lesson sequence? I'd love to hear your feedback. Since winter break I've been working on a video about how to talk math with your kids. I hope you enjoy it. Some background: I began reading Christopher Danielson's website Talking Math With Your Kids right around the time my son was turning 1. J wasn't yet old enough to talk math with me, but I was excited to witness someone learn the very basic ideas of math, firsthand. In short, Christopher's website absolutely transformed my parenting. I learned how to probe and prompt my son, how to push him into new territory and how to let up when he got bored or frustrated. And I am happy to say that I am the proud parent of a 4 year old who loves talking about math. I've shared my experiences on Twitter through the hashtag #tmwyk, where I have also gotten great ideas from other parents. I've loved sharing these moments on Twitter and among friends, but I've been straining for ways to share these ideas with the broader world. There are so many parents of young kids who ask me for advice about math apps and workbooks, so I know there is a yearning in parenting culture for guidance about math readiness. This video is my attempt to distill the big ideas of #tmwyk into an accessible video. Less charitably, it's eight minutes of my big dumb face. But I hope that this video helps parents find new ways of interacting with their kids on math topics. And if it's well-received, I'd love to make more. So please watch the video and share it with people who might find it interesting! Caution: this is an inspirational story of a child overcoming obstacles to succeed beyond anyone’s expectations. So at the bottom I’ve drawn out two lessons I learned from this student that teachers don’t often talk about. In my first three years of teaching, I taught a girl named, let’s say, Ana, who started 6th grade as a terrified, anxious student on the verge of failure and ended 8th grade by placing out of Algebra 1 and into Geometry for high school. Since that time, she has continued to make remarkable progress as a math student, beyond even what I thought she was capable of doing. The funny thing is, her transformation happened so slowly that I almost didn’t notice. Her improvement during her three years in my class was so steady and gradual that I didn’t fully recognize it until the spring of her 8th grade year. Ana walked into my class in 6th grade with a crippling math anxiety. Her struggles in math were so profound that she had been diagnosed with a math-related learning disability. She hardly knew any of her multiplication facts (she struggled with 4*3, for instance), and the sight of word problems on a math worksheet terrified her into paralysis. But over the course of the year she got to work. She never spoke up in class, but as I walked by her seat she started asking me questions. She completed her homework every night and came in before tests to ask me questions. She still failed many of those tests, but she retook them until she passed them. In seventh grade, she opened up a bit. She still didn’t like talking in class, so I told her that I would only call on her when I knew she knew the right answer. With that assurance, she started sharing her ideas in class more and more. Her work improved, but was still marred by years of conceptual gaps that she was still struggling to overcome. She was moving in the right direction, but she had a long way to go. I remember working with her after school one day. After a few warm-up problems, I told her we were going to try something different. “Here comes the boulder” she said. I asked her what she meant, and she said “You’ve been giving me the pebbles. Now you’re going to give me the boulder.” She always had a way with words. In eighth grade, Ana took Algebra 1 because it was the only course offered at our school for 8th graders. We knew that this would be a struggle, so I met with Ana and her mom and assured Ana that this would be a great year to build a foundation in algebra so that when she went to the public high school, she could take Algebra 1 again and feel very comfortable. Ana took this as a personal challenge. She started working in small groups, sharing her thoughts and asking her classmates to critique her work. She became an advocate for her own learning. At the end of the school year, she took the placement test for high school and placed out of Algebra 1! I didn’t know what to say, so I met again with her and her mother. We all agreed that if the high school felt that she was prepared, she should give it a try. I kept in touch with her mom since that time. In 9th grade she did so well in Geometry that her teacher recommended that she move up into the honors program, an almost-unheard-of advancement in this challenging school. She continued to succeed in the honors course and recently earned a score on her Math ACT that places her in the 95th percentile nationally. This is just staggering progress. This girl went from being one of my biggest strugglers to being among the top math students in the country. Pebble by pebble, she built a mountain. Because of Ana, I can’t believe that kids who struggle in September are damned to struggle for the rest of their lives. Because of Ana, I know that kids’ brains truly are capable of remarkable growth, and that we don’t truly know a child’s potential until we give them a sustained opportunity to find out for themselves what they are capable of achieving. Ana is the reason I don’t write kids off as lost causes. If I did, I would have written Ana off pretty quickly. And she would have continued to struggle, and she would have stayed in the low track, and she never would have found out that she is actually a very good math thinker. And I’d be another teacher who talks about “high kids” and “low kids” as if those are two distinct and immutable categories. So yes, this story is inspirational. But that’s not why I wanted to share it. I have two other reasons. If I hadn’t taught Ana for three years in a row, I never would have known this story. I just happened to be the only math teacher at this small private school, so I just happened to teach the same students in 6th, 7th, and 8th grade. As a result, I got to see Ana blossom into a strong math thinker. But if I had only taught her in say, 7th grade, I never would have seen that transformation. I would have seen a girl grow from a weak math student to a somewhat-less-weak math student. And I never would have recognized the enormity of the shift that she was undergoing. That’s because learning doesn’t always move at the pace of the school year. Sometimes it happens glacially, and only those adults who know a kid for several years get to see the full trajectory. I worry about this fact because the vast majority of middle and high school math teachers do not loop with their students. Most of us only get to see our students for one year. Most of us miss these types of stories, which means we are more likely to believe that “low kids” stay low forever. That worries me. One of the things I learned was that if you can really devote yourself you will be able to do anything. I come into math every morning so that I can go over the homework and so that I can understand what is happening in the class. I have learned that learning is a process and that you can’t expect to learn everything in one day. I used to think that I could spent ten minutes on an idea, but I learned that that is not true. Man, does this hit me so much harder than a generic inspirational story. And it rings truer. Math is still hard for her. But she's made a commitment to improve. She made it in 6th grade, then again in 7th, again in 8th, and in every year since then. I mention this because I want teachers to remember what we are asking our struggling students to do. We are asking our students to work harder than their peers to catch up in math, and then continue working harder than their peers for the rest of their educational lives. That's a huge thing to ask of an 8 year old, or an 11 year old, or a 15 year old. But that's what we're asking. I believe that kids can grow smarter with hard work and dedication. I've seen it firsthand. But now, thanks to Ana's email, I know just how hard that hard work can be. Congrats on not using a textbook, Kent. Now what? In my first job, I taught 6th, 7th, 8th, and Algebra 1 every year. My administration gave me a list of standards for each grade level and a bunch of textbooks, 3 of which were abysmal. (One was pretty good). So that year, most of the lessons I taught were either compiled from elsewhere or written by me. And for the past seven years in three different schools, it’s pretty much been that way. Aside from that old Algebra 1 class, I’ve never used a single curricular resource as the backbone of my classes. Right now I teach 8th grade and Algebra 1. For linear functions, I use Moving Straight Ahead from the Connected Mathematics Project. For the Pythagorean Theorem, I am adapting a unit from a Carnegie book I got a peek at. For expressions and equations, I am adapting a bunch of Heinemann's Transition to Algebra resources (not enough white space). For intro to functions in Algebra, I am combining some Carnegie stuff with Laying the Foundation, a set of curricular resources developed by the National Math and Science Initiative. For various lessons I use Mathalicious or Desmos or Shell Centre or something else. For squares and square roots, I am writing and rewriting my own unit. And I am not the greatest at organization, so I often find myself digging through old binders or Google Drive folders looking for that activity that went so well last year. It is completely exhausting, and yet I don’t know any other way to teach. I can’t use my district’s current textbooks because they are horrible. We don’t have money for the textbook I would prefer. I asked. So all I can do is write my lessons fresh every night and hope someone listens to me in two years at the next textbook adoption. I don’t know how ong I can keep it up. I keep hoping that things will get easier - that I will settle into a groove and be able to edit, rather than rewrite, my lessons. But as I've grown as a teacher, I've started to see that 10 great lessons do not make a great unit. There is a level of coherence that I only just started to really notice, and it doesn't exist in many of my cobbled-together-with-duct-tape units. I was talking today with a colleague who has been at it for a while now. She has trouble with the textbook and tried to move off it last year, but she sensed that lack of coherence and it really bugged her. So she was telling me that she's back on the book for Algebra 1 this year, but still trying to teach Pre-Algebra with the materials we are all creating or collecting. I showed her how I am introducing Unit 2 of Algebra, with some number tricks and mobiles adapted from Transition to Algebra, and she got really excited. "This stuff is great! They will really be able to see why we use inverse operations to solve equations!" She borrowed my worksheet and made copies for her class. She reported back this afternoon that the lesson went well - kids were engaged and motivated. She asked if I had any more stuff like that - it's too daunting for her to make whole packets of material like that on her own. Fortunately, I do have more. One day more. Then I'll be at the copier or on Google Docs, cutting and pasting something new for my students and hoping that it all coheres at the end. My colleague wants to use good resources and teach good lessons. So do I. But I don't know how long either of us can keep it up at this pace. And this sure as hell isn't a model that is going to lead to effective math instruction in every classroom. I'm not the first teacher to talk about this. Chris has, Dan has, Dylan has, even the President of NCTM has. I don't have an answer. I'm just trying to add my experience to the conversation. I am contributing to Tina Cardone's Day in the Life series this year. I'll be writing about the 12th of each month. Then this morning I had to get both kids fed, dressed and out the door by 7am (wife still not home) so that I could get to school by 7:50. My first period came in at 8:05. So needless to say, I wasn't in the groove yet when they arrived. My Pre-Algebra lesson today is an introduction to the Pythagorean Theorem. In general, I like to start my units slowly. I'd rather make sure everyone is beginning from a place of comfort and then ramp up the intensity towards the end of the unit. This is not how I've always taught, but rather an approach I've developed over time. Left:How I used to introduce new content. Right: How I introduce new content now. So I'm not going to use the phrases "Pythagorean Theorem" on day 1. Instead, I hand everyone a slip of paper with this triangle on it. I ask them to brainstorm everything they know about the triangle in groups. As I walk around I start to hear encouraging words like "perpendicular" and "isosceles." My students, for some reason, are particularly behind in geometry. I don't know if it's a matter of emphasis district-wide or some other reason, but I find that there is no such thing as "too obvious" in 8th grade geometry. How long is the longest side? This is the point at which my planning really fell off the rails. I expected my students to notice immediately that the longest side was longer than 5 blocks, but this turned out to be very controversial. You see, the long side does cut through 5 blocks, so some kids thought it was the same length as the others. I ended up getting a bunch of rulers and asking the students to measure all 3 sides with the centimeter side. We got 6.5, 6.5, and 9 inches as the measurements. Then one student said "The long side is 7." "I used my ruler to see how many blocks long 9cm was, and it's 7 blocks. So the short sides are 5 and the long side is 7." Holy crap - she's right! Or at least, the long side is VERY close to 7. In fact, we are going to prove that very thing today! And she discovered it on her own using a totally different method! I had lightning in a bottle, but honestly, I had no idea what to do with it. Then I looked around the room and saw how my students' engagement level was dipping. So I asked them "Can someone explain E's strategy for finding the length of the long side?" Nobody could. So I asked E to explain herself again. I ask again "Can someone explain E's strategy?" Still nothing. I realize that I have done a bad job of implementing a very important element of classroom culture: the idea that students need to listen to each other. So I start calling on students at random, asking them whether they can explain E's method. Three students in a row can't explain it, even after E repeats herself to each of those students. Finally the fourth student explains her strategy. I am running out of time and we aren't even close to done with this lesson. So I wrap up with a crappy little lecture about the importance of listening that I am sure sailed right out of their heads the second the bell rang. Fortunately, I had a free period to reflect on this experience. In my second and third Pre-Algebra classes, I explicitly pointed out this method of measurement, but complained about its imprecision. "This is the best we can do? Get out a ruler, measure the line, and then measure some blocks to estimate how long the line is? There's got to be a better way!" That is a common refrain in my class. I do the whole infomercial voice and everything. So then I hand out this sheet of paper, where the triangle has a square coming off its hypotenuse. I ask students to draw and shade in squares for the two legs. We talk about how the small squares have an area of 25, which makes sense because the square root of 25 is 5, which matches the side lengths. So then if we knew the area of the big square, we could take the square root to find the length of the hypotenuse! Then I get the kids to count the squares inside the big square. Most kids come up with something around 50, which leads to a side length of roughly 7.07. Pretty good thinking, E! I wrap up class by saying "So that's how you find the long side of a triangle. You draw it on grid paper, then make a square from the long side, then count the area of that square, then take the square root of that area to find the length. Unless... there's a better way." We'll be cutting out the small squares and fitting them into the big square like puzzle pieces tomorrow. I am proud that I was able to incorporate E's idea into my subsequent lessons, even if her class didn't get that same experience. I'll be sure to bring them into the fold tomorrow. My worst decision was not making 10 minutes to review my lesson at some point on Sunday night or Monday morning before I taught it. I need a fresh look at a lesson within 24 hours of when I teach it. Planning a lesson on Friday for Monday is fine, but only if I review it quickly on Sunday or Monday. My challenge right now is managing all my responsibilities in school while also pursuing career goals outside of my classroom and being the primary parent. Here are my yearlong goals aside from "be a good 8th grade math teacher"
Tutor a former student who is struggling in high school geometry. It's a lot. Something's probably going to fall by the wayside, and I don't know what. I have a student who started the year with a pretty oppositional attitude to her teachers. On top of that, she has significant conceptual gaps in her math background. But she is a critical thinker and can make connections on her own when given enough support. So I have been giving her praise whenever it felt authentic to me, and meeting with her some one-on-one to give her some of the foundation she needs to succeed in my class. She is slowly warming up to me. I am still reading a lot. I have been working through some of the Transition to Algebra resources, which I really enjoy, and reading Connecting Arithmetic to Algebra by Russell, Schifter and Bastable. I will need to make a pre-assessment for expressions and equations by next month's post. I am co-planning a lot with my colleagues, and I LOVE it. I love when I make a lesson that succeeds in my coworkers' classes, and I love using a lesson found or developed by a colleague that connects with my students. If I weren't coplanning, I wouldn't have even found the lesson that I screwed up today! But I am convinced it's the best way to introduce the Pythagorean Theorem that I've found. In my last post, I wrote about my big-picture thoughts on Number Talks. Here's a post about the nitty-gritty. Today in Pre-Algebra we are reviewing how to convert from fractions to decimals. I have this worksheet for all the fractions from halves to tenths. To solve this whole sheet, students will need to do some long division, so I chose a number talk that might bring up long division naturally as a strategy. Billy started us off with long division, the traditional algorithm. I'm glad he brought it up and glad to get it out of the way! Theo said "I added a 0 and got 360. I know 360 degrees is a full circle, so 180 is a half circle. Then I took away the 0 and got 18." This was unexpected but awesome! I asked for clarification from the class as to what we are doing mathematically when we "add or take away a zero" and talked about how we are multiplying or dividing by ten. Elsa broke up 36 into 30 and 6 and found half of each, just as I anticipated. I reminded my students of the name for this strategy: decomposing 36. I like that term because it sounds gross and is memorable for that reason. Billy said you could count by 2's until you got to 36. I wrote it down but kind of brushed it off. In retrospect, I should have dug deeper. Why does this strategy work? Why don't we count be 3s or 4s? If we did count by 3s, what would that find for us? What a missed opportunity! Instead, I asked everyone to try Elsa's strategy on the number 74. I got a kid to explain it, and we realized that he not only decomposed 74 into 70+4, he then decomposed 70 into 60+10! So we had a double decomposition. Ok, these guys rocked it. I had a total of 8 strategies for solving this problem! Karina said that 3/2 = 1.5 but she knew it was really 15, so I made another student explain that part. Anna Marie used a building-up strategy to find what added to itself to equal 30 and then 6. Above, you can see where I pointed out that both of them had decomposed 36 in the process of solving their problem. Elizabeth Rae used a similar building-up strategy to Anna Marie, but with a twist. She said "I know 15+15 is 30, and I know that 8+8=16, so I figured out that 18+18=36" I asked her to expand on that, and she said she was using the units place to figure out that 8 and 8 make a number that ends in 6, and 18 is close to 15, so it made the most sense as an answer. Landon started with 15 as well, but multiplied by 2 instead of adding it to itself. Then he guessed and checked until he found 18. Jackson decomposed 36 into 20 and 16 instead of 30 and 6! What a great moment! I asked the question "So can we just decompose 36 into any pair of numbers?" and a kid said "As long as they add to 36, it should work." We will definitely need to revisit this in the future. Reggie found a pattern with 6. 6*2 is 12, and when he added 6 to the first factor and tried 12*2 he got 24, so he added another 6 and tried 18*2 to get 36. I'm still not sure how he stumbled on this idea, but it's cool! I hope he brings it up again in the future. Jeremy decided to divide 36 by 4, since he knew that math fact. The he multiplied than answer, 9, by 2 to get 18. I asked another student to explain why this work, and I used a visual model (at the top of the picture) to solidify the explanation. Kayla used the traditional algorithm! Finally! This period we had our first controversy! One student got 13.5 and another got 18. All last week, we had controversy every day, so I was actualy surprised that we hadn't had disagreement in A or B period. I always get excited when a student voices a wrong answer because they might be brave enough to share their thought process and explain their mistake. Anna Lane decomposed the problem in the way I anticipated, into 30 and 6. Haley used the traditional algorithm. Grant did the strategy I was anticipating but unsure of, where he knew that 6*6 is 36, so 3*6 is 18. I asked him "Why not cut both numbers in half?" And he said "that wouldn't work." And I said "why?" and it got a little confused but eventually someone said "because 6*6 means you are counting six 6s, so Grant is only counting three 6s. So that's half"
After Haley did the traditional algorithm, Macon said "I see what I did wrong. I did long division, and I knew that 2 goes into 3 once and 2 goes into 6 three times. So I got 13. THen I knew I had a remainder of 1 from the 3/2, so I brought down a zero and did 10/2 and got 5, which I added at the end as 0.5. But I needed to bring down the 6 and do 16/2"
I then pointed out that his idea was almost right! He divided 30 by 2, not 3, so that 0.5 should be in the units place, where it would add with 3 to get 8. Then he would have gotten 18. This is where I wish I had my Great Mistakes board up so I could give the class a point for Macon's great mistake. Until this year, I can't think of a single time I've had 8 students share 8 different ways to solve a single problem. B Period was on fire. And we built another bit of classroom culture that the more ideas, the better. I need to pull back my participation. I did a couple of moves where I said "someone else explain that to me" but in writing this blog, I realize how many times I added something that I didn't need to add. I like the idea of "Try Elsa's strategy on a new problem" as a good way to extend the conversation if there aren't a ton of different strategies. The same kids keep sharing. I think I am going to grab a couple of shy kids on Monday and say "I would love for you to share one method in our Number Talks this week. Raise your hand on a day when you feel comfortable sharing"
In a month or so, when I introduce the distributive property, these kids are going to roll their eyes at how obvious it is. I think I will slowly formalize my notation until I write these problems in a way that looks more and more like the distributive property. Seven days in, and I am sold on Number Talks. I had been hearing about Number Talks for a couple of years, but it was finally Megan Schmidt's persistent updates on Twitter that made me try them in earnest this year. Pick something cool or interesting from a student strategy and highlight it or ask a question about it. So far, my goal has not been mathematical, but instead to model and promote the sort of mathematical conversations I want to hear in my class. But because my students are awesome, we got some great mathematical conversations anyway! For example, in one class a student solved 111 - 29 by "sliding" the problem up by one, up to 112 - 30. I asked for another student to explain the strategy and then modeled it using a number line. It became a favorite strategy all week for kids, until Friday when a student used the method to slide 5.1 - 0.35 down to 5 - 0.34. This promoted a GREAT conversation about why we need to be precise with our language in math class. Kids had been saying "five point one" or "point thirty five" but then switched to "five and one tenth" after this conversation. I think this will be a more memorable lesson because it came up in the context of a mental math problem that students had thought deeply about. I will probably start recording some of these talks and transcribing the best bits for future blog posts. Seriously, I wish I had a court stenographer in my room so I could just show you guys how great the conversations have been already. 1) Read Making Number Talks Matter. Seriously, it is such a good book. It's full of great classroom tips to promote and deepen student thinking using the Number Talks structure. Even Mr. Taylor, my inclusion co-teacher, got in on the action! 3) Have the kids stand up. I think it sets a tone that this is using your brain in a different and more active way than most warm-ups. Besides, kids have fewer distractions when they stand. 4) One idea I haven't started yet is to have a Great Mistakes board to provide an incentive for students to share their ideas, even if they may be wrong. The idea is to give each class points whenever a student makes a mistake that leads to a valuable learning moment, such as the place value error in the decimal problem above. Extra points for a student who bravely shares something they did wrong and explains why it was wrong or how to correct it. When the class gets to 10 (or 20 or whatever) points, the whole class gets a prize. Our school is trying a positive behavioral support system that I might try to tie into my Great Mistakes board.